News : SuperSiblings, put together by Prachi Garg, an upcoming release by Srishti Publishers! Putting together stories of twenty enterprising siblings who have carved a niche for themselves and their passion, SuperSiblings by Prachi Garg is an upcoming release by Srishti Publishers. It is third in a series of books encouraging youngsters to follow their passion by starting up brand new and innovative ventures. It follows Superwomen: inspiring stories of 20 women entrepreneurs, and SuperCouples: inspiring stories of couple-preneurs. 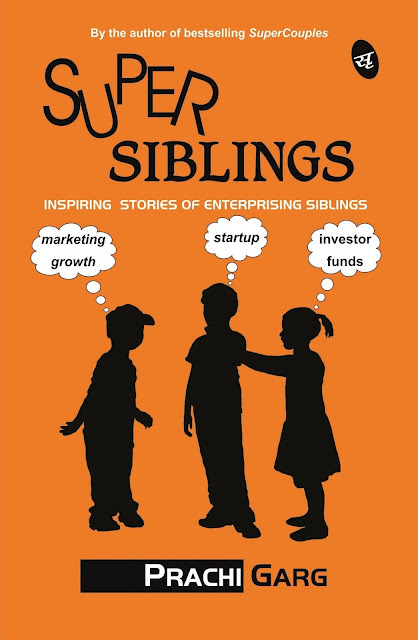 The book primarily endorses the idea that while entrepreneurship requires the right partnership and compatibility with the right people, it is not impossible to find them within the family, in your sibling. In an era where trust is hard to find, siblings are banking on and supporting each other to achieve their dreams. Encouraging entrepreneurial thinking, motivating innovators to take the plunge, and inspiring young entrepreneurs to break their shells – Prachi Garg puts together life-stories of 20 siblings who have successfully carved a niche for themselves and their startups in the recent past. Spanning a whole new gamut of ideas, the book talks of startups in the following industries: apparel, technological innovations, jewellery, mobile phone applications, designer footwear, corporate solutions, language and content solutions, and food. These young entrepreneurs have not just fought odds in terms of their startups, but also the society. Being at a crucial age where the ‘others’ expect you to either make a stable career and ‘settle down’ in high-paying jobs, these siblings have shown exemplary courage and fought all odds. SuperSiblings encapsulates the journeys of twenty siblings who have broken away from conventions and supported each other to startup their dream ventures.